Data Center Infrastructure Management (DCIM) is a centralized solution for monitoring power consumption of cooling system and other environmental variables in a data center and in IT systems, as well as managing space utilization and system lifetime. Every organizations needs an energy-efficient data center but what happens to most organizations is that they are satisfied with some of the actions already taken to reduce energy consumption despite the fact that the data center is constantly changing. Current energy conservation methods may not work in the next months, and power consumption should be regularly monitored. 1. Monitoring the energy efficiency. The quote “If it can not be verified, it is not manageable” is ideally suited to the power management of data centers. DCIM software enables organizations to connect power measurement devices installed throughout the data center to monitor power consumption up to the rack level. This enables the data center administrator to see real-time power usage effectiveness (PUE). If the PUE starts to rise and the ambient temperature is not too high, it means that there is something wrong that needed to be checked. DCIM system will let the organization know what’s going on with computer room air conditionings (CRACs), UPS, rack and other equipment so that the trouble spot can be found. The cooling system is a part of the data center that consume the highest energy and is the area that the highest energy can be saved as well. Controlling the entire cooling system to work correspondingly is important to maintain the right temperature level with the most efficient operation. When data center supervisors try to control the cooling themselves, they often fall into situations in which each device works differently. For example, when a supervisor sees that one rack is too hot, he adjusts the temperature of the nearest CRAC resulting in another part of the data center getting too cool. So, another supervisor adjusts another CRAC temperature. It is the same as driving the car by touching the brakes and throttle at the same time. DCIM is a tool that allows organizations to control every CRAC as the same unit for maximum efficiency in data center operations. 3. Data distribution to fix the high temperature area. The better way to handle overheated rack is to understand the cause and correct it. Generally, the problem is caused by too much data in the server on the same rack and it exceeds the cooling capacity. In this case, the virtualization software will facilitate the data migration to another rack. DCIM software will help to find the rack with less data to process. Distributing data within the data center will make CRACs work more efficiently and consume less power. 4. Assist in moving, editing and changing information. The comprehensive data center management will enable supervisor to cope with moving, editing and changing of information which is happening continuously. When the organization buys a lot of server blades, it can be packed into a rack with empty space. If the rack has other information, this may not be the best option. DCIM software will help you find the rack that has enough space and power. This will not cause excessive heat when data is collected. 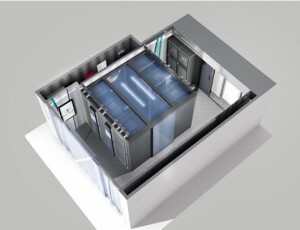 Managing this holistic data center will reduce overall energy consumption.